A short piece of track on Dundas Square beside the CITY-TV studios was the last piece of live street trackage in Toronto with paving setts instead of concrete. Concrete work continues on the east leg of the intersection, and the special work for remaining sections is sitting on Victoria Street south of Dundas Square awaiting installation. A week after construction started, assembly of the major pieces of special work has completed, and attention turns to the various bits of tangent track linking the intersection together and with its three approaches. Concrete work on the Dundas Street leg has begun. In mid-1996, this intersection was rebuilt, although the south leg was untouched leaving the paving blocks on Dundas Square that have now disappeared. The intersection itself has changed a lot in two decades. This entry was posted in Dundas Car, Transit. Bookmark the permalink. Given that Church is so close to Yonge – and has loopable abilities using the Wellington tracks, has the TTC ever though about figuring out how to reuse Church for additional services? I know looping at the top end could be a challenge, and a serious lack of vehicles. But…. one does wonder. Steve: Yes, the top end would be a problem, but more to the point, “relief” for the Yonge line requires intercepting passengers before they get to the most congested point, not simply providing added capacity in a hard-to-reach location (a far more difficult transfer than Bloor-Yonge station itself). Leaving aside capacity issues, this is a generic problem for all of the proposals of surface relief routes in the core area, and why both GO Transit and the DRL have such important roles in the network. In the late 1980s, the Bay St. “clearway” was set up, and trolley coach service on 6 Bay was very frequent. While it didn’t help people coming in from north of Bloor, it did help the people arriving at Yonge via the Wellesley bus and Carlton and Dundas cars to get further south to downtown. The trolley coaches on Bay could operate at quite a clip. But I don’t see a streetcar service on Church being anywhere near as fast. You might as well take the current shadow of the Bay bus, or, if in the east, Sherbourne bus (frequent, but frequently packed with George Brown students). What’s the point of wasting money on all this streetcar infrastructure when Bombardier can’t even make streetcars on time or in good working order? Steve: The fault lies not with streetcars but with the manufacturer. There was a time when their subway car delays were badly behind schedule. Should we have cancelled subway expansion? Effective immediately, westbound traffic will not be able to travel on Dundas Street between Church and Victoria Streets until July 28 due to road conditions. From July 17 to September 16, eastbound traffic is not able to travel on Dundas Street between Bay and Church Streets, as the City of Toronto completes watermain construction work, and starts TTC track work and road resurfacing along Dundas Street. 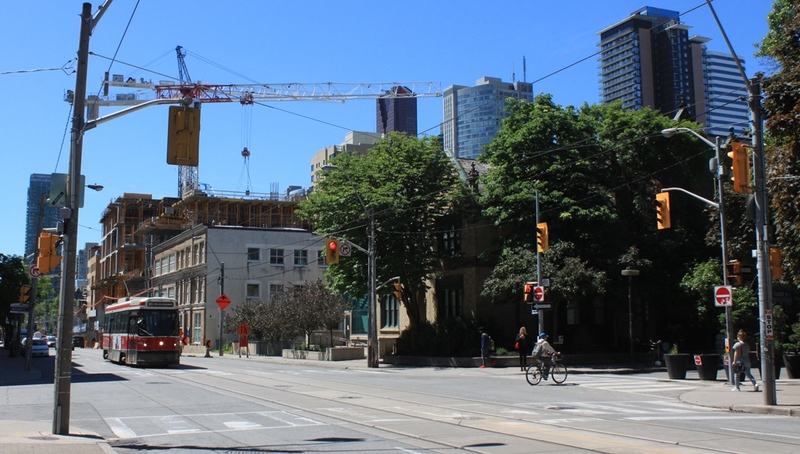 In addition, Victoria Street will be closed in both directions, between Dundas Street and south of Dundas Square during the same July to September period. The overall project is ahead of schedule and is expected to be completed on September 30 instead of on October 31. The work is being done to reduce the risk of future watermain breaks and improve the quality of the streetcar tracks. Extended hours, from 7 a.m. to 11 p.m., are being used for this project. In addition, some portions of the work will take place on a 24/7 basis to help minimize the disruption. However, the noisy work including concrete breaking and removal will stop at 11 p.m.
Not to be too picky but I think the “paving blocks’ that used to surround the TTC tracks were actually square setts. Steve: They are square in cross section, but rectangular in the aspect they present to the street surface. “Setts” generally can have various proportions.